No, this is NOT a picture of my house. 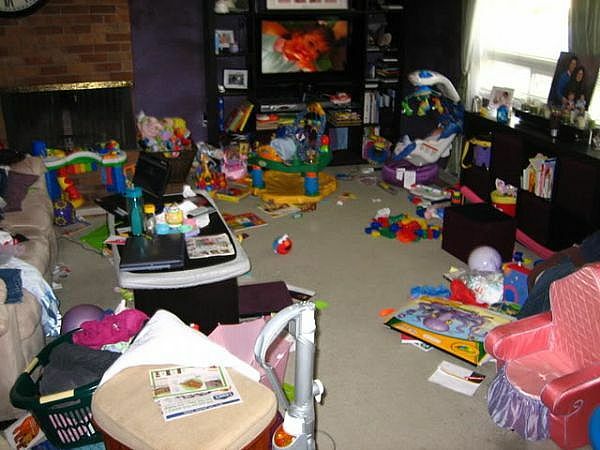 LOL But, there are MANY parents who DO have rooms in their homes that look just like this. I have actually seen worse. For a while there was a show on A&E called Hoarders and I don’t know, but I really loved it. It was hard for me to fathom how some of the people lived collecting junk and not able to let any of it go. Some people literally lived in filth and garbage and it was all because they had this emotional attachment to THINGS. It was so sad to see how hoarding totally destroyed their lives and many are not able to get out of it. But for many families clutter and mess is actually the norm. Maybe not to the extent of hoarding, but like the picture of the room above. I mean you can still see the floor, but the STUFF is everywhere! If you have multiple children, then you know how difficult it can be to keep your home clean and in order. It seems like everyday there is a new mess to clean. The toys are everywhere. There are crumb trails leading from the kitchen to the living room. It just never ends! It can be even hard to stay on top of things for those parents who work outside of the home. If you are working all day and only have a few hours at night to tend to the many other responsibilities, then there is even less time to clean up. I have been very blessed to be able to work both in and out of the home. I am able to set my own schedule. But even then, when things get ultra busy – it is really easy to put off getting the house in order. And once you let it go for even just a week or 2, it can be a HUGE challenge and take an entire weekend to get back on track. So, I have come up with a few ideas that work for me and my family that help us stay on top of the small messes around the house so that they do not get out of hand. I hope that they will help you as well. 1. Get the Kids Involved. 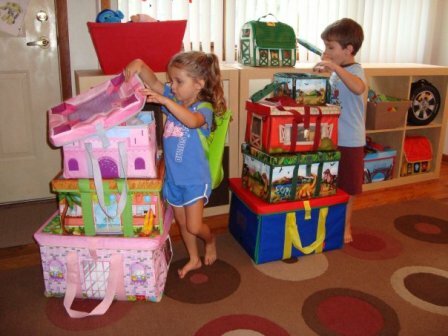 You can start your children out early with helping you do small chore like tasks around the house. You can give each child a specific job that they do on a daily basis like making their bed. Or you can also cal on them as you need help to do things like set the table or get a garbage bag to put in the garbage. I used to have a special sheet with little chore pictures on it for my children and when each thing got done, they got a sticker next to the chore. We did it for about a month and my kids didn’t care about it anymore. I am thinking about starting this up again though. I am definitely guilty of not being consistent and that is really important. 2. All Messes Gone Before Bedtime. This is something that has really helped me to feel more peaceful at night. Unfortunately, we do not have the luxury of having a separate playroom just for the kids. We have to share the living room space with the kids. So, it is even more important that the toys do not get out of hand. My children know that they cannot take out all the toys at once and they can only play with a few things at a time. They also know that all the toys need to be put away in their specific bins before we start our nightly routine. 3. Daily Cleaning Routine. I not only follow the above rule for the kid’s toys, but I also do the same for other areas of the house. The kitchen is one of them. I make sure all food is put away, dishes are done, floor is swept and clean, etc. But a big thing for me, is during the day, when I am walking from room to room and I see something out of place, I don’t ignore it like many of us would. I actually take the time to stop and pick up whatever it is and put it away. And at the end of the day, Ido a walk around the house to make sure all the random little things are put away like papers, random toys, clothes, etc. This helps keep things totally under control so that when we wake up in the morning, the house is clean and there is not so much to deal with. If you keep up with the smaller messes on a daily basis and are consistent, then you will never have to deal with an entire weekend of cleaning and organizing again! Of course, you have to still CLEAN, but the organizing part will not be as overwhelming. So, how about you? Any neat ways that you like to keep your home in order?